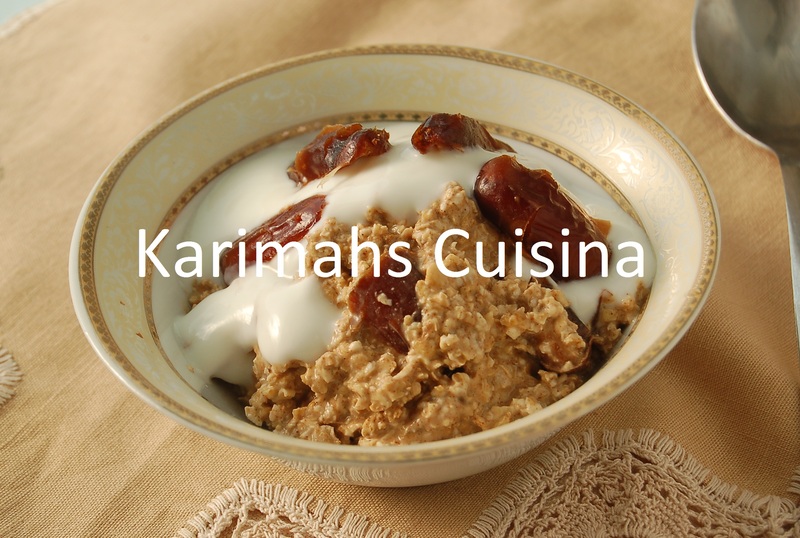 It’s really important before embarking on this LIVE BELOW THE LINE challenge to plan what you are going to eat, rather than rummage around at the last minute clutching at straws, so here goes Karimahs Cuisina’s first recipe to start the day off well. In the morning strain oats. Add ½ tea spoon of dry cinnamon and ½ tea spoon of ginger powder and stir. Now oats are purported as a superfood , which they are , good for the nerves and fatigue as they are high the minerals manganese, phosphorus and selenium but they don’t suit everybody, just like rice doesn’t suit everybody. This is because everybody has a different temperament, a climate a vibration. Hence the adage “one man’s meat is another man’s poison” which also supports the theory that there really is enough to go round if…. On this meager diet cinnamon provides manganese, fiber, iron, and calcium. Its anti-inflammatory, lowers cholesterol, reduces proliferation of some cancers, good for the brain and cognitive functions. Ginger is also an amazing root/spice. Its also anti-inflammatory, anti-cancer. It’s good for the prevention of ovarian and colon cancer, morning sickness, motion sickness, prevention of colds and flu, migraine relief and menstrual cramp. It’s great for wind in the stomach which you may get from the beans you will eat on this challenge because you won’t be able to afford any other protein except for cheap eggs. It is effective against E.coli induced diarrhea, especially in children. It contains vitamin B-5 and B-6 as well as minerals like potassium, manganese, copper, and magnesium. Potassium is an important component of cell and body fluids that helps controlling heart rate and blood pressure. Drink the date water and add dates to oat/spice mix.Dates are little powerhouse of multi vitamin and minerals. They are low in fat and contain no cholesterol. They are a rich source of protein and dietary fibre, they contain vitamin B1, B2, B3 and B5. They also contain vitamin A1 and vitamin C. gates are great for people suffering with constipation; soak them over night in water, eat the dates and rink the soaking water the following morning. They promote sexual stamina and can be soaked, de-stoned, in goat’s milk overnight, the next day blend together with honey and cardamom. They help in weight gain, are good for stomach cancer and are great for alcoholic de toxification. Top with yoghurt and enjoy.There is a reason why we have used yoghurt over milk, milk contains a type of protein that is difficult for humans being to digest, maybe for the face that we have one stomach , whereas the baby cow, it was intended for, has two stomachs. Yoghurt on the other hand has gone through the process of fermentation; in this process it cultivates bacterial cultures that make digestion easier. Milk also contains a sugar called lactose, which some people find intolerable, especially people from warmer climate like Asian, Afro Caribbean, Southern Europeans and South American. As a general rule, a lot of bacteria that are active in the fermentation processes love sugar, they eat the lactose and turn it into bacteria that is useful for the stomach.